And so our transportation begins to Esperance in 1979, a time just a six years after the infamous Starman's desire to meet humankind was communicated in song. It turned out to be a year when he would indeed meet humanity in kind, in the form of the fallen Skylab-- NASA's space station used to test astronauts and the capabilities of humans in space. No one could have predicted the impact that the end of this obscure, gigantic paraphernalia’s life would have on tiny communities as its parts were sprinkled across Western Australia. The genius of Melodie Reynolds-Diarra's Skylab is that in creating it, she has taken this extraordinary event, extracted the heart of it, and sculpted it into a tale about how just one unusual event can impact an ordinary, unassuming suburban family, sculpting a tale of imagination of astral proportions. Like any good play, what anchors this production is a set of wonderful, dynamic characters and experienced actors to bring them to life. The children, in particular are absolutely outstanding. The cast of children I saw (Juliette Laylan as the curious and spirited Amy, Liani Dalgetty as the sassy Sonia and Benjamin Narkle as the hilarious Nate) showed a competent naturalism and rhythm in their acting that is very rare among child performers. The family dynamic, headed by patriarch Nev (Alan Little), mama Jem (Lalo Bano Rind) with frequent pop-ins from Jem’s paranoid, the-government-is-out-to-get-us brother Harvey (Gary Cooper) is so natural and utterly believable. The chemistry between the characters in turn is exemplary, and it is clear that director Kyle J Morrison has excellent rapport with all of the actors. 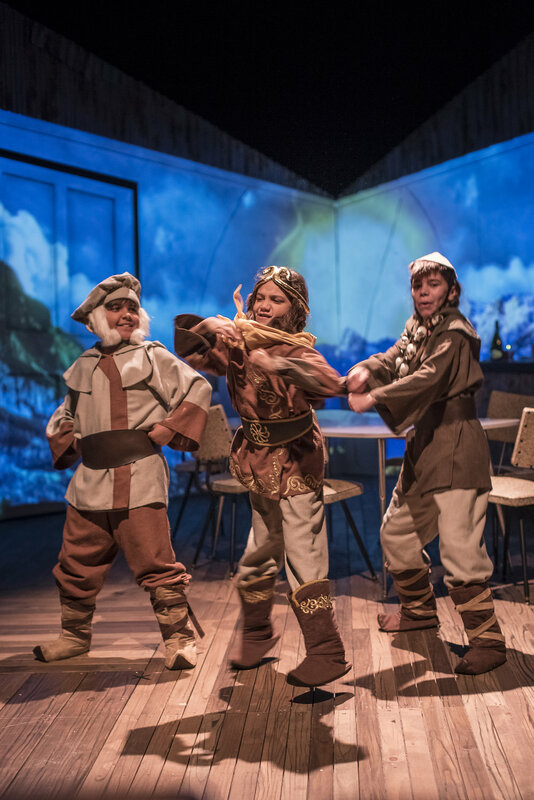 The play’s set design is some of the best I’ve seen in a long time; it looks gorgeous, with its tilted studio-home layout, and place changes are easy to follow, thanks to designers Matthew McVeigh, Kelly Fregon and Mia Holton. What made this play so wonderful, in addition to all the technicalities, was the rich Indigenous culture interwoven so integrally into the story. This is an Aboriginal Australian family presented in a way which is not always consistently done so in many forms of Australian media, and this is important. The inclusion of native language is also a poignant touch, bringing a sense of powerful connection to this land which, as is pointed out many times in the play, has been Aborignal land for many tens of thousands of years. As much as the eccentric character of Harvey might be seen as a little strange to say the least, with his tin foil hat and paranoia towards America, his character is the one who speaks up about many of the sad realities of Indigenous treatment in modern Australia. Many a time he speaks of young ones losing touch with the dreaming and their culture, and in a moment of particularly biting honesty, Harvey talks of the mental prisons he believes the Americans are trapping them in with all of the space research going on, brought into stark parallel with the message of the shocking incarceration rate of Aboriginal Australians. Skylab is in all honesty one of the plays of the year for me—it’s just so masterfully done from script to stage. From suburban bustle to fantasies of Vegas in Elvis costumes brought about by some supernatural force the fallen Skylab has conjured to Monkey Magic sequences, this is a magnificent play of dreaming, stardust and the importance of holding on to culture as the age of Skylabs come and go and may indeed come again—it is a play for all who have dreamed and dream. Skylab plays at the State Theatre Centre until September 3, before heading around regional WA. More info and tickets can be found HERE!